* Above standard listing shows items already available. More items to be available upon request. * Custom requirements to be possible from us for use in high drain, high temp, etc. 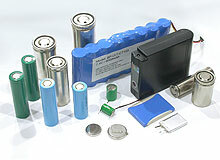 * Bobbin technology batteries feature compact size with high capacity, also capable of high drain application. * Specialty batteries mainly refer to electronic cigarette usage. May also apply for other custom applications.